Showing 1 - 1 of 1 Products for Truck Bed Rack Lock. 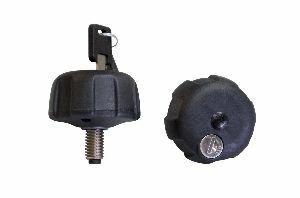 Locking TracKnobs are a theft-deterrent device designed to add security to your TracRac (Sliding Only) System. The top of the knob spins freely when locked so that the over racks cannot be moved or removed. To unlock, simply turn the key and the cylinder engages the knob allowing the users to disengage the thread and move the racks.